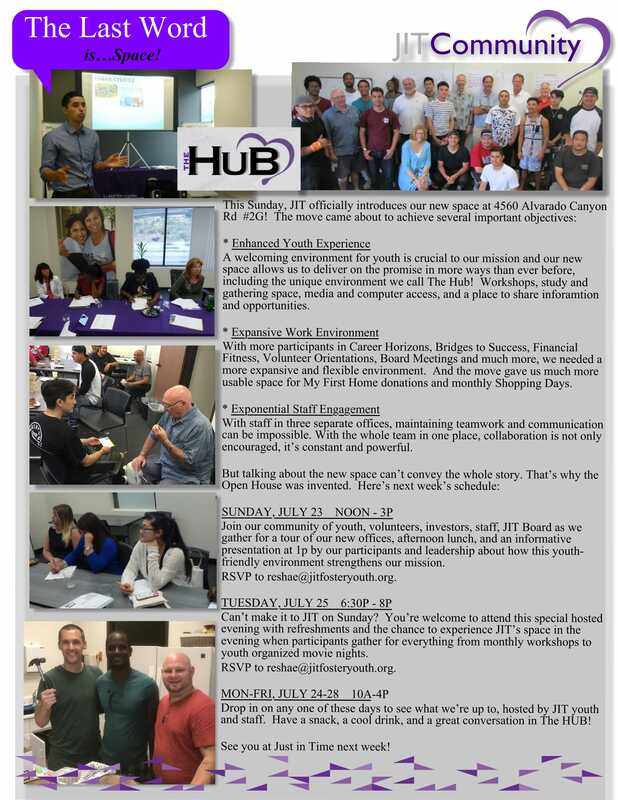 This Monday Memo is about our move and Open House Events! DID YOU KNOW our recent move came about to achieve several important objectives?! A welcoming environment for youth is crucial to our mission and our new space allows us to deliver on the promise in more ways than ever before, including the unique environment we call The Hub! Workshops, study and gathering space, media and computer access, and a place to share information and opportunities. With more participants in Career Horizons, Bridges to Success, Financial Fitness, Volunteer Orientations, Board Meetings and much more, we needed a more expansive and flexible environment. And the move gave us much more usable space for My First Home donations and monthly Shopping Days. With staff in three separate offices, maintaining teamwork and communication can be impossible. With the whole team in one place, collaboration is not only encouraged, it’s constant and powerful. But talking about the new space can’t convey the whole story. That’s why the Open House was invented. 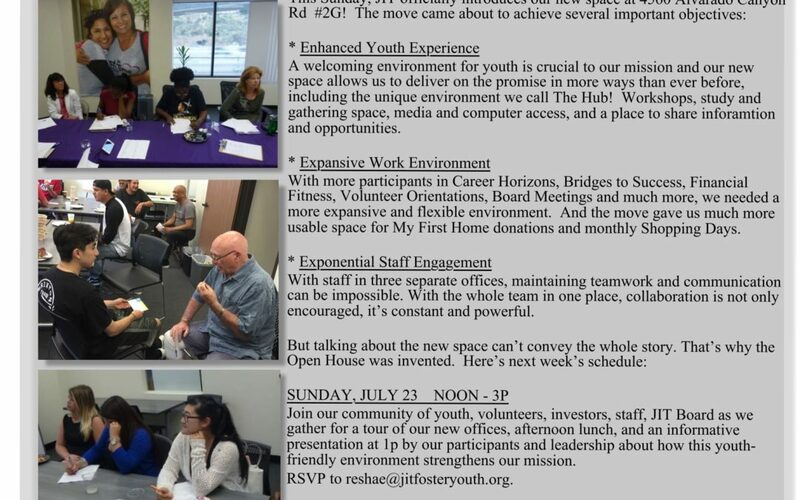 Join our community of youth, volunteers, investors, staff, JIT Board as we gather for a tour of our new offices, afternoon lunch, and an informative presentation at 1PM by our participants and leadership about how this youth- friendly environment strengthens our mission. Can’t make it to JIT on Sunday? You’re welcome to attend this special hosted evening with refreshments and the chance to experience JIT’s space in the evening when participants gather for everything from monthly workshops to youth organized movie nights. 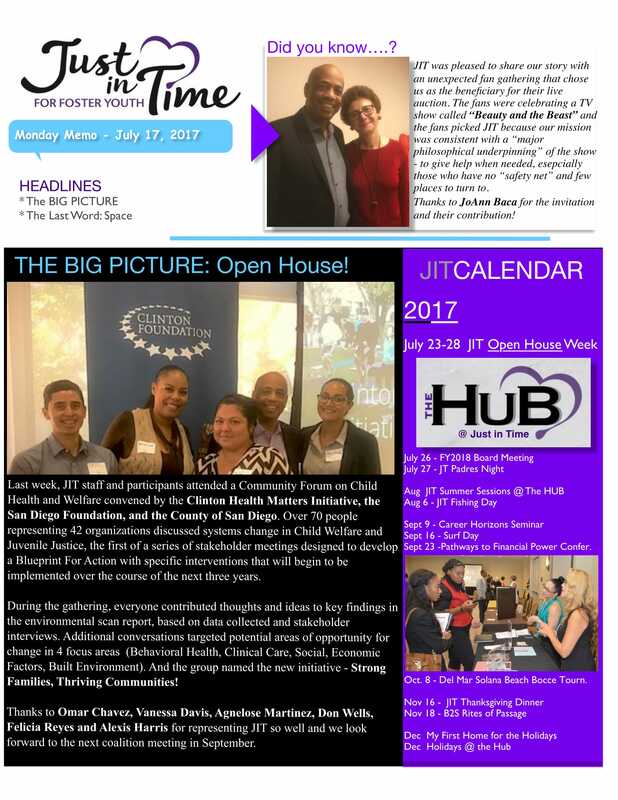 Drop in on any one of these days to see what we’re up to, hosted by JIT youth and staff. Have a snack, a cool drink, and a great conversation in The HUB! See you at Just in Time next week!